About 3 years ago I was in Burlington, Vermont on a work trip. At lunch on my first full day there I pulled up the local events to see what was gong on. Like a lot of folks I try to see as much as possible when work sends me to new and ‘exciting’ places. Unfortunately, I’m often in new towns and cities during the week, not on the weekends, which means there isn’t a lot happening. But, it was clear that Burlington offered entertainment everyday of the week. I browsed a few of the bands playing that night on YouTube and decided to take a hike through the city to a place called Higher Ground, where a three piece called Jukebox the Ghost was playing. From the time they came on the stage to the time they left, I was blown away. The band consists of Ben Thornwell (Vocals and Piano), Tommy Siegel (vocals & guitar) and Jesse Kristin (drums). Their music is catchy and infectious in the best way. Their first album, ‘Let Live & Let Ghosts’ is a fantastic ode to the pop format with enough twists and turns to keep even the most strident musical cynic waiting for the next turn of phrase. Songs like, “Hold It In” and “Under My Skin” are both unique and familiar all at the same time. Now with four albums in their repertoire, a stellar appearance on Conan O’brien, and lots of tour dates, it appears that 2015 is the year of the ghost. The folks at Mobtown Studios (a website worth checking out!) took a number of great pictures of the band when they stopped by to perform a few songs. 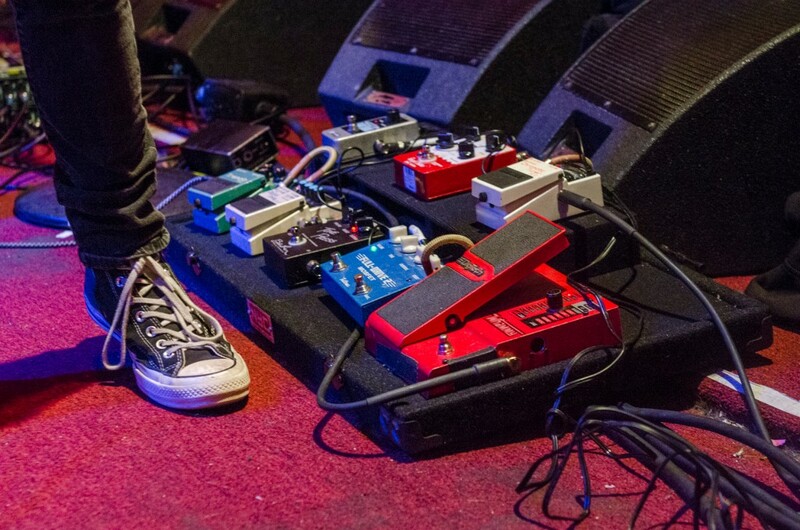 Among those pictures are a shot of Tommy Siegels pedalboard. Take a look at what’s he got and check out the band – which will actually be returning to Vermont in February while on their current tour. Let us know if you’ve heard of JTG before and what you think.